A lot of dedicated hard work went into getting this initiative for using shops in the Hastings township to renew and regenerate the township. Hastings has been needing a boost to its economy for a while and it has taken a group of artists, galleries and members of local and state government working together to get the project off the ground. Copyright can be a confusing or even annoying subject for some artists but it is important. Now that we have access to so much information on the web and digital information and images are common, we need to understand that even if the law in some cases seems to be lagging behind technology, it doesn’t mean that the intent of copyright is not to be understood and adhered to. In this editorial, I want to address a few issues with copyright and clear up a couple of definitions. I will also provide contact information if readers want more details. 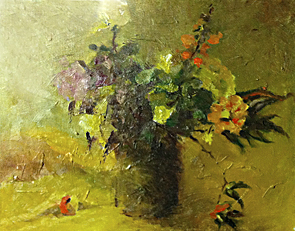 This workshop covering still life in oils was also the first to cover the theory of tonality using a particular colour. Tonality in painting, unlike what we may think of in photographic or print terms for graphic designers, can mean using a dominant colour in a painting. Picture a cast over most of a scene or design, it can be red, blue, green, yellow or nearly any colour, this colour dominates the painting and is used in some cases to knock back or alter the intensity of other colours so that they relate to the dominant colour. You can see this in real life in sunsets or sunrises where the light has a tint to it that affects everything in the landscape. For our last workshop covering still life subjects as our theme, we were introduced to this theory of tonality applied to our still life subject. Our colour was yellow and we were asked to produce a light tonal painting in the morning and a dark tonal painting in the afternoon, under the supervision of our tutor, David Chen. As with all workshops, David began with about thirty minutes of theory to help us grasp the theory behind the practical work we were about to do. This is very involved and I will do my best to cover what we learnt as it was presented. As if determined to run us off our feet, we were set up for a day wandering from one end of town to the other to see a wide variety of art. First up was a group exhibition by recent graduates from RMIT who have set up a shop front gallery and are bringing attention to it with work in this fairly hard to find first floor gallery in King Street, Melbourne. Hard to find because the only thing from the street that you see is a door with the number on it, so the venue lost points for me straight away for having a poor street profile. The very old stairs to the first floor weren’t too OHS friendly either, so disabled would have trouble attending. Its on its way at last. Here is a progress PDF of the book for the year’s project! The Works on Paper is a regular event held by the MPRG in Mornington, Victoria. Artists are invited to enter this award to have their work looked at by a selection committee, who then choose the finalist to be displayed in the gallery. From there the winner and acquisitions are announced.